← Not in the Mood for Feathered Food. I’ve Got A Golden Kinglet! 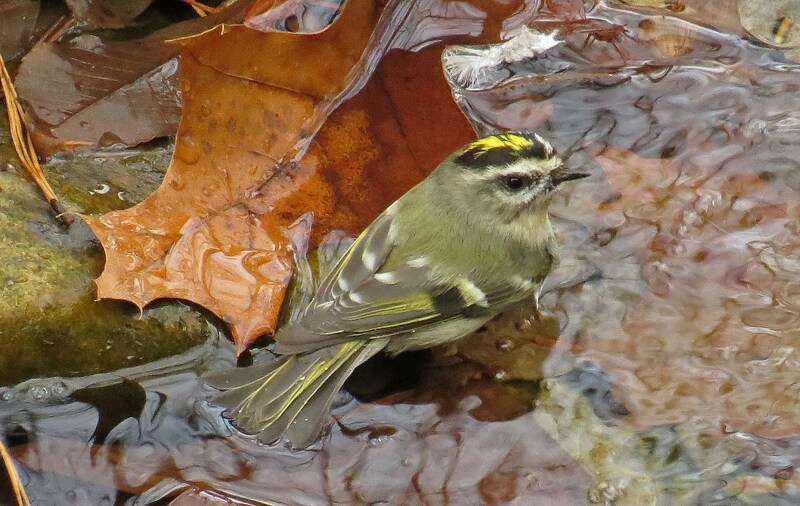 I’ve got a Golden Kinglet…I’ve got a Golden Kinglet…a Golden-crowned Kinglet that is…I’m hoping all you Willy Wonka fans sang the title appropriately! I was thrilled this afternoon to see this fellow taking a dip in the fountain. I had noticed him flitting about several weeks ago (and these birds do fidget and flit!) but I didn’t have my camera handy. Today is the first time I actually managed to capture one in a photo. Last winter, his ruby-crowned relative was a regular visitor at our feeders. I even had him eat out of my hand once, which was quite cool. The picture below is one of my all-time favorites. Here’s hoping that these royal little birds make my backyard their winter residence. This entry was posted in Backyard Birds and tagged backyard birds, bird watching, birds, kinglet, nature, photography, wildlife, wildlife photography, writing. Bookmark the permalink. 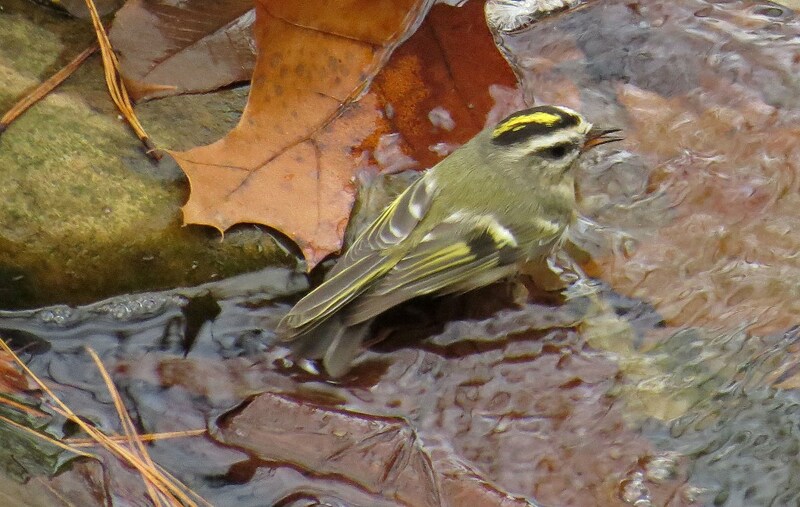 17 Responses to I’ve Got A Golden Kinglet! I live in Hiram which is Northwest of Georgia. How exciting! What a beautiful bird, gorgeous! I know that sure made your day a good one. Never seen one in my neck of the woods. 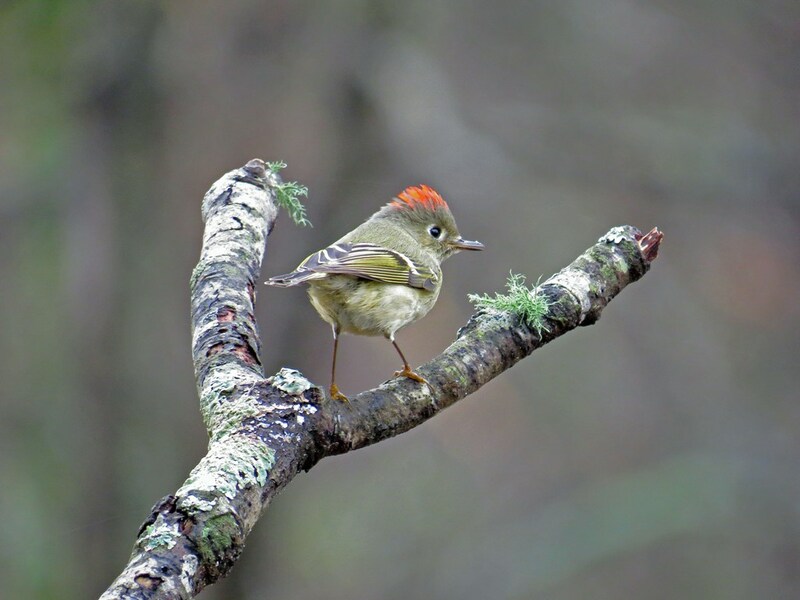 And you had a ruby-crowned kinglet eat out of your hand. I am so jealous. ,-) I can’t even get my little kinglet to sit still long enough for me to take his picture. Thanks Alan. I think the reason he ate out of my hand was because it was in the midst of Atlanta’s crazy winter weather last year and he wanted to be sure he got some food! Nice shots of the birds. Wonderful pictures! Absolutely beautiful bird, I know you’re excited. And several excellent photos, at that! Their beautiful bright heads bring such brilliant color to the fallen leaves in the rain! And I love the shot of the red-head 😉 I hope they become annual ‘regulars’ in your yard. Beautiful pics, that fountain and bird bath are certainly an asset for bird photography! My husband put in the fountain…it is a recirculating water fall, and the sound of the running water really does seem to draw the birds in. congrats — very nice!! 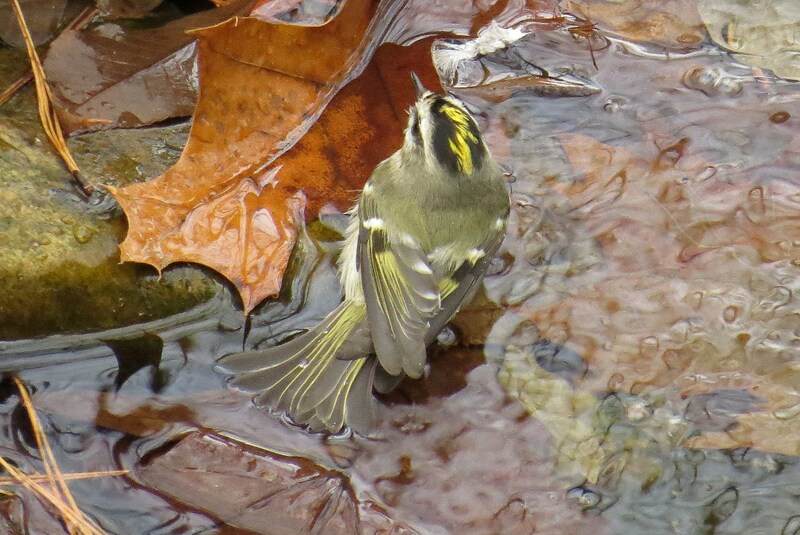 we have recently discovered at least two Golden-Crowned Kinglets at our place. I think they love the suet and the berries. hoping to be able to photograph them someday!! Be sure and let me know if you get a photo. I’d love to see it! the only photos I’ve managed to get of these little sweeties is elsewhere!